For inserted wiper dies, a manner of attaching the insert into the holder by a flat-head cap screw which is threaded into the holder through a countersunk hole in the bore of the insert; for this reason, sometimes called “bore-mount”. This is in contrast to the original type of attachment in which the screw is threaded into the insert through a hole in holder. 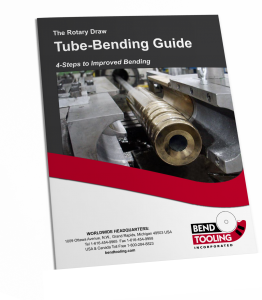 The advantage of a reverse-mount inserted wiper die is the easy access to the screw while the wiper is fixtured on the bending machine. However, because of the countersunk hole in the bore of the insert, reverse-mount may not be suitable if the wiper must be fixtured at zero-rake.